1. Combine Chipolte Pepper and Tomato Paste in a small bowl until thoroughly blended. Set aside. 2. Combine Chili Powder, Cumin, and Cayenne in a small bowl until thoroughly mixed. Set aside. 3. Heat Olive Oil in Dutch Oven over medium high heat, until shimmering. 4. Add Green Pepper, Red Pepper, and Onion. Saute until soft, about 8 minutes. 6. Add Turkey, Salt, Pepper, and Parsley. Cook until Turkey is no longer pink, about 12 to 15 minutes, stirring regularly. 7. Add Diced Tomatoes. Stir to combine. 8. Add Chipolte Paste mixture. Stir to combine. 9. Add Spice mixture and Worcestershire Sauce. Stir to combine. 10. Bring Chili to boil. 11. 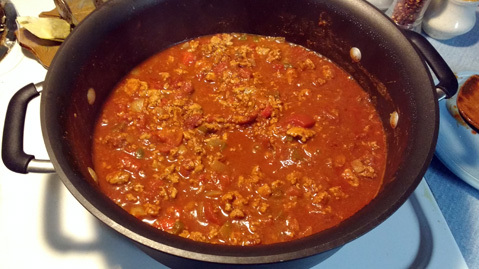 Reduce heat immediately and simmer for 1 hour and 30 minutes (or longer, if desired). 12. Add Kidney and Black beans. Stir to combine. Serve with additional chopped yellow or green onions, sour cream, cheddar cheese.